Safariland 6280 SLS Hooded Level II Duty Holster FREE SHIPPING! An essential peice of police equipment, the Safariland 6280 Holster provides police officers and others who carry handguns in tactical situations the optimum combination of safety and performance. This version of the Safariland SLS System duty holster features the patented rotating hood and tensioning device for increased weapon retention, yet still affords ease of draw and quick, secure reholstering. The Safariland 6280 holster is a top draw, straight cant duty holster. Manufactured of long-lasting Safari-Laminate and lined with suede to protect the finish of your gun. Choose from plain, basketweave, gloss or nylon look finish. The 6280 holster is also available in a tactical Fine-Tac finish. 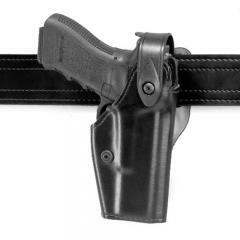 The Safariland 6280 holster is designed for use with 2.25" wide duty belts. For additional security, these options are available for your 6280 Holster at CopsPlus. Easy to use, easy to learn weapon draw, as much tension as you like and easy to disengage weapon retention with the rotating strap. The high gloss is typical Safariland: easy to maintain and clean. The "suede" liner is easy on the firearm finish, and unlike my coworker's holster, does not leave any wear marks. The holster's protection for the weapon light is a plastic cup at the muzzle, over my TLR-1's lens. This keeps excessive debris or intrusion from scratching a somewhat expensive addition to my Glock 34. I honestly have no complaints or regrets for purchasing this holster. It was well worth the wait. Holster provides a perfect fit and is seamless in it's operation. Highly recommended. Holster is one of the best I've had. It keeps my glock secure and it's easy to use. Holster is great and functions well. however, the leather will wear out if you have a narrow seat and a metal center console in patrol car. Fits like a glove and I am very pleased with it. Good quality holster that fits a TRL-3 light in addition to the TRL 1 and 2. I am a really thin guy and I have problems with the plastic belt loop attachment and support piece digging into my hip bone. There's really no comfortable way for me to wear it. I'll probably have to find a different belt loop attachment for this holster to fit me comfortably. The holster overall is the best holster I have ever used on duty. I have both the holster with and without the light attachment, love it. Excellent Product, Fits My Service Firearm perfectly. It does not require any breaking in. Excellent holster at a Great Price. The holster was better than I thought it would be, I would not hesitate to order again. Will this fit a CZ75 SP01 tactical? Yes, the CZ75 SP01 will fit the tactical as the only difference is the ambi-decocker as oppose to the manual safeties. It will accommodate a m6 light depending on what kind of gun you have. Can this holster be upgraded to Level III? Yes, you will need the "Safariland 6001 SLS Holster Sentry Security Option" which will increase the level of security. ©2002-2019 CopsPlus.com: Safariland 6280 SLS Hooded Level II Duty Holster FREE SHIPPING!